You made me cry, Sabeen Mahmud. Karachi is an insane city. A true Karachiite can never live anywhere else. A visitor can never understand why that is so. The fascination is irrational and does not compute. Some think it is an asylum gone wild, others feel that the patients have taken over the administration. Sabeen Mahmud was the head of our administration, the chair person of our union, the flag bearer of our mental asylum. In a crazy city designed for crazy people, Sabeen was our wildest flame. If she captured you in her orbit, it wouldn’t be long before you would be wearing that crazy gleam in your eyes. When the city went mad in 2007, Sabeen and Zaheer Kidvai came up with The Second Floor (T2F). When you have had more than your daily dose of work, family, neighbors, KESC, traffic and Karachi, you could escape to T2F to listen to Tee-M sing Suji Ka Halwa or play Jazz, expose your musical ear to some exotic Qawali or equally exotic drinks. T2F was the only drinking hole in town where you could hear Muhammad Hanif read a case of exploding mangoes, discuss science with Pervaiz Hoodhbhoy, or debate cultural, political and social taboo(s) in a cozy, intimate, friends only evening setting. It was a space for Karachi’s citizens. An oasis of sanity in a city filled with angry men and women, bearded, mustached and otherwise. I had heard of Sabeen, we had met a few times but it was only when I saw T2F in 2007, that I realized that Sabeen was just as crazy as the rest of us. Only a certifiably insane person would try and feed a dose of culture to these wild Karachiites or put up a reading library next to a kitchen. Boy, did we lap it up. T2F became the place you would go to when you had some time to kill, when you were thirsty for a green apple chiller or a corned beef sandwich, when you wanted to feel normal; the normal one can only feel when surrounded by like minded fools and fruit cakes. And because of Sabeen and T2F’s magic, because of her orbit, because of the mad gleam in the eyes, there was never any shortage of fruit cakes. T2F was my space, our space, Sabeen’s space. A corner where you went for a bit of quiet and a pinch of hope. It was the original inspiration behind every single shared work space and social ada that followed. But T2F and feeding Karachi culture were the sanest of Sabeen’s crazy ideas. She had quite a few that were really out there. From taking back the city and the country from angry bearded men who favor burqahs on fashionable occasions and photo opportunities; to giving voice to those who would never be heard otherwise. Her most remarkable contribution was testing the thesis that a politician can only be born and associated with a political party and a lineage going all the way back to the British, the CIA, our feudal lords or the Army. She joined hands with a lawyer from Karachi who became a test case for proving the established political thesis wrong. He lost the local elections in May 2013 but gave us hope that young men can change our city; one day perhaps even our country. Mohammad Jibran Nasir was certainly a big step for Karachiites but the real payoff for Sabeen’s many friends were her resulting Facebook conversations. To say that Sabeen was politically active is an understatement. She was self professed anarchist and experience junkie and she really believed in spreading and sharing that message. Her experiences side by side with Jibran made for entertaining, sometimes scary reading. From taking on the Lal Masjid gang in Islamabad to getting arrested in Karachi; from organizing events, protesting at rallies and dharnas, attending jalsas and commentating on both organizational abilities and content of parties irrespective of their ideology. Boldly going with Amma, to places, locations and events where I wouldn’t dare to go without four double cabins. From death threats that were not funny to distasteful verbal abuse that was shrugged off and turned into Facebook posts and jokes; most memorably her running commentary on one exceedingly handsome heartbroken police javaan, off do-talwar; and of things that could have been, but will never be. 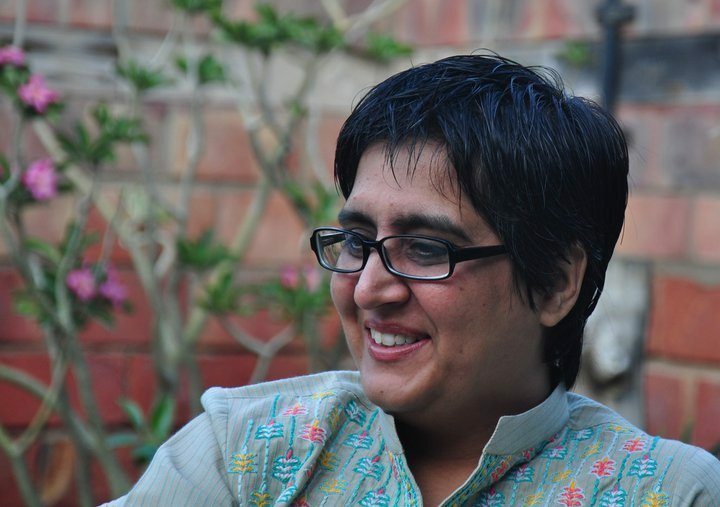 I didn’t consider myself a friend of Sabeen, because I didn’t do anything to earn that title. I loved her work, her intellect, her curiosity and her stance. I admired her wicked sense of humor and her desire to question overzealous authority and self righteousness. We had great conversations on political king makers and king making in the city. To me she was a symbol of what this city could be if my fellow fruit cakes took it over. In a town where everyone talks in double speak, where empty grand expressions use cheap lyrics from Bollywood songs, where we rely on the depth of oceans and the height of mountains to quantify relationships, Sabeen spoke plainly and simply. She would have wanted me to do the same. Right back at you, Sabeen Mahmud, right back at you. Previous Previous post: The fastest 11 years old in Karachi.